In a 2012 article on the BBC website, the inventor of PowerPoint, Robert Gaskins, recounts how Microsoft bought the software on 31st July 1987. At the time, he says, Bill Gates was not entirely sold on what was the firm’s first acquisition. Fast forward 30 years and one suspects Gates has had a change of heart. PowerPoint is said by Microsoft to have been installed on over a billion computers worldwide, and isn’t close to being troubled by any competitors where market share is concerned. Gaskins muses that, all things considered, the $14-million purchase may ultimately have been more valuable to Microsoft than any other acquisition it has ever made. All that is not to say that the success of the deal was a dead cert, of course, or that Gates was wrong to be cautious. It merely serves to make plain what an impact PowerPoint has had since its launch all those years ago, and how inherently intertwined it is with the history of Microsoft itself. This is a little ironic, because, prior to being bought by Microsoft, PowerPoint was first launched on the Macintosh in 1987. Indeed, the popularity of PowerPoint 1.0 on the Macintosh is credited to some extent with the early success of the PC after the sale. Had Gaskins and his team at Forethought opted not to sell, we may have seen a great deal more parity between Apple and Microsoft in those following years. Microsoft did continue to develop PowerPoint for the Mac, but it is the story of it its life on Windows that really charts its rise to the top. Despite the deal being struck in 1987, it actually took a further three years for a Windows version of PowerPoint to be released. This was as a result of the software needing to be redeveloped for the Windows platform – the barrier that reportedly led to its initial release on the Macintosh in the first place. The software was released as part of what was the all-new “Office” productivity suite. As you might imagine, it is unrecognisable from today’s all-singing, all-dancing slide-deck editor. Nonetheless, it revolutionised how we would give presentations and, despite its low-res, pixelated graphics, had the basic features upon which today’s version is still based. Text and graphics could be added to slides and a slide sorter allowed slide-decks to be organised. For all its dominance now, Microsoft’s first version of PowerPoint had a lot of competition and it didn’t always compare favourably. This began to change with the firm’s second and third versions, PowerPoint 3.0 (which was eventually renamed PowerPoint 1992) and PowerPoint 4. Two Infoworld articles from the time reflect the strides in development that Microsoft made. The first, in 1992, describes PowerPoint 3.0 as having caught up with the competition, by way of new features like TrueType font support, transition and build effects, new graph types, added drawing tools and something that remains central to the Office user experience today – a toolbar with shortcut buttons. Two years later, Infoworld declared that PowerPoint could “finally compete with the big guns of presentation software.” Among the “bells and whistles” about which it waxed lyrical were on-screen help and tutorial functionalities, an improved drawing toolbox and a “more intuitive slide transition routine.” Its integration with other Microsoft programmes was also hailed. For many people, Windows 95 was their first experience of Windows. That’s not just anecdotal – the platform sold 10 times as many copies as Windows 3.0. Part of the reason for this were the new features with which it was shipped, such as a new graphical user interface, the recycle bin, the taskbar and, most famously, the start menu. PowerPoint for Windows 95 took advantage of the operating system’s new performance capabilities, with 32-bit coding and much improved support for multimedia like sound and animation. It boasted a slicker interface and the ability for users to move their presentations between computers more easily than had previously been the case. In many ways, it was the first in a new era for PowerPoint that continues to this day. With the release of PowerPoint 97, Microsoft continued to cement the software’s dominance. Where once the company had been playing catch-up with new features, now it was innovating. In ’97, it introduced the ability for multiple versions of the same presentation to be saved in one file, the Slide Finder for locating and reusing previous slides and the ability to save presentations for use on the web, with navigation controls, frames, animations and user voice recording. 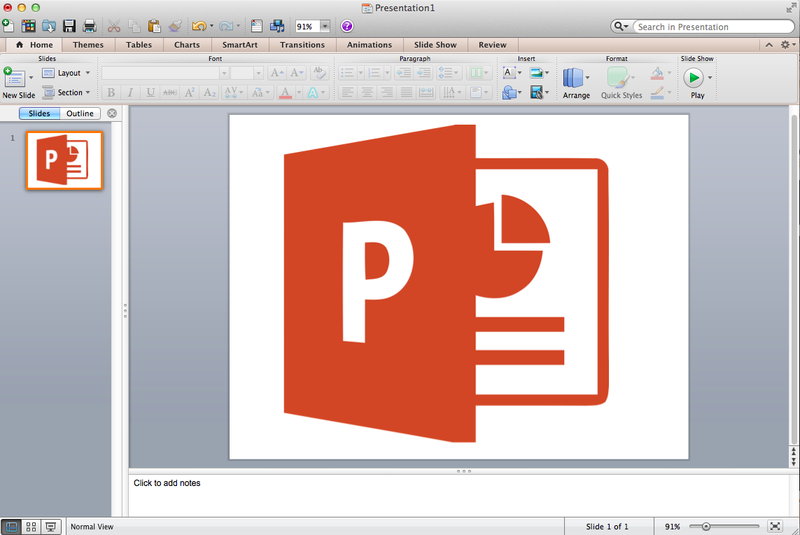 Although less celebrated than some earlier versions, PowerPoint 2000 introduced a number of major features that are still with us today. Most notably, a new tri-pane view that displayed slides, outlines and notes within the same screen. Automatic resizing of both slides and text was introduced, meaning we were no longer faced with text running off slides and slides that were too magnified, and so too was the ability to create tables within the programme itself. In the early 2000s, two more versions of PowerPoint followed in quick succession. PowerPoint 2002 and 2003 saw iterative changes that were more evolution than revolution. These included new Outline and Slide thumbnail views, image compression and rotation advances, ways to navigate slide-decks and annotation options. Then after the raft of new PowerPoint versions and feature additions, everything went quiet. When PowerPoint returned with Windows Vista four years later in 2007, it was a noticeably different animal. In the sense that it introduced a number of features on which the most recent versions are still based, it was all grown up. Most notably, 2007 saw the introduction of the ribbon menu, which split opinion at the time. For an increasingly powerful piece of software, though, this allowed users to access more functionality more quickly. Live Preview allowed users to see what changes to objects would look like without actually applying them and, in a big step forward, Presenter View used dual monitor support to display slideshows differently on different screens for audiences and presenters. As in the 2000s, the following two versions of PowerPoint added iteratively to the earlier major release. In 2010, collaborative working features were developed so that users could co-author presentations at the same time, presentations could be remotely delivered online and the ability to export a presentation as a video was introduced. 2013, meanwhile, saw the introduction of the now familiar start screen in place of just a blank new slideshow, threaded comments for collaborative discussion, and more sophisticated Presenter View options. Perhaps the most significant introduction during that period, though, was that of Office 365, in 2011. The new online version of the Office suite allowed PowerPoint users to create and collaborate on presentations in the cloud, reflecting Microsoft’s future intentions for software provision. In 2014, meanwhile, Office apps came to iPads and Android tablets, catering for the continued proliferation of mobile devices. Despite competition from the likes of Keynote and Prezi, PowerPoint still stands apart as the go-to tool for creating presentations. The most recent version, PowerPoint 2016, has seen refinements to existing features and the continued introduction of new innovative features. Updated Smart Lookup functionality allows users to view Bing search results from within the programme for quick reference, while PowerPoint Designer gives users ideas about how they might approach the design of their slides. Elsewhere, the newly introduced Morph Transition provides a smooth and cinematic means of moving between slides and the new Zoom feature is a visually exciting way to leap between slides and sections without having to simply scroll through slides one after another. It’s also possible to insert screen recordings and see more detail when co-authoring presentations. Today’s PowerPoint is an incredibly powerful piece of software, which has been three decades in the making. Indeed, the biggest hurdle to creating stunning presentations with PowerPoint now is knowing how to use all of its features. The very fact that presentation design firms like ours can exist is testament to that. While Gaskins’ assertion that PowerPoint may have been the best $14 million that Microsoft ever spent is one mark of its significance, so too is the fact that this single programme has spawned industries like ours all of its own. This was a guest post from Lyndon Nicholson, the Chief Executive of Manchester-based presentation design agency Buffalo 7, clients of which include UEFA Champions League, Microsoft, Red Bull, Samsung and Swatch. He has written several articles about presentations and presenting, as well, of course, as having presented on the topics.